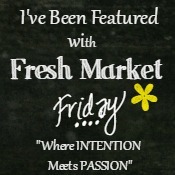 For this Friday-food and music to fill you-body, mind & soul! A while back my wonderful friend Lori gave me this granola recipe I love – it’s healthy, full of whole grain protein and not too much sugar (uses agave instead). I have tweaked it and added my comments to the recipe below. I eat it with Greek vanilla yogurt-(fat free) and whatever fresh dark berries I can find. I add more dried fruit in Winter. We had it for Bible study last week so I’m now naming it Wellness Granola! 1. Preheat oven to 300°. Combine all ingredients except dried fruit in a large bowl and toss to combine. Spread out on a rimmed baking sheet. 2. Bake granola, stirring every 10 minutes, until golden brown and dry, 40-45 minutes. Let cool on baking sheet (it will crisp as it cools). 3. Mix in dried cherries or cranberries (or blueberries). Store airtight at room temperature for up to two weeks or so. Granola can be made 2 weeks ahead. This comes together quickly-make some today and enjoy breakfast tomorrow! What do you fill your mind with? I love music, it inspires, moves and motivates me especially when in the car or while walking/exercising. I can be seen rocking out in my car – just ask the kids! During the Lenten Wellness Journey, I shared some inspirational songs which became the wellness journey playlist. Others found it inspirational so it’s back and updated for the Fall Wellness journey! Some speak to my Soul, some more to what I want for my Mind and some keep my Body moving and motivated while exercising. One Thing Remains by Kristian Stanfill – great reminder that God’s love never fails! Keep Making Me by Sidewalk Prophets – God wants all of me, not just what I want to give him. The best way to do this is to empty myself to be completed by Him. Start a Fire by Unspoken – I want to start a fire in my soul to make everyone see my light comes from Him! Hurricane by Natalie Grant – God finds me no matter where I am or what I’m going through, He will find me in the middle of hurricane! Say Amen by Finding Favour-Can we all say amen this great message reminding us that God has worked in all our lives and will continue-say Amen! Multiplied by NEEDTOBREATHE –God’s love will find us when we continue to surrender to Him! Live with Abandon by Newsboys –This song helps me remember to focus my thoughts and all I am on Him and not myself. No Man is an Island by Tenth Avenue North-We are all here in this life together so love even when not convenient or comfortable! Shake by Mercy Me-I have loved this group for years and this song as soon as I heard it. While in the MRI machine to determine my knee diagnosis, I could pick the music. I chose the Christian station and this song came on. Visualize me rockin’ out to the song and trying desperately to stay still for the MRI! Thought you’d like a laugh today! Made New by Lincoln Brewster-I am made new with God living in me. Great beat! Love, Love, Love by Sidewalk Prophets –Fun beat and catchy tune to remind me to love, love, love!! Lay it Down by Sanctus Real-Great reminder to give it all my issues to Him-physical or otherwise. Be strong in Him and lay it all down at the cross. Open Up the Heavens by Meredith Andrews –Quick guitar beat to exercise to while it reminds me to worship Him and call on Him no matter what I’m doing! Do Life Big by Jamie Grace-Perfect song to wrap up this list-I want to think, look up, listen and do life big-see what God has for my life! See if any of these inspire you on your wellness journey… and have a fun, fit Friday full of health and wellness in Him!